No one disputed that Arthur Ashe, the African-American tennis champion, humanitarian, and Richmond native son who had died recently from AIDS contracted during a blood transfusion, deserved a statue. Whether a street known internationally for its statues of Confederate heroes was the right place for Ashe or the only place for Ashe was the subject of a debate that focused international attention on Richmond. As Richmonders in 2017 debate the future of Monument Avenue’s Confederate statues, it is useful to recall how 21 years ago – and 19 years after African Americans achieved majority control of the city government – Richmond integrated its most famous street. Unlike the organizational efforts responsible for the five previous Monument Avenue statues, the Ashe statue originated almost by accident. After meeting Ashe in 1992 and learning of Ashe’s dream of building an African-American Sports Hall of Fame in Richmond, sculptor Paul DiPasquale proposed a statue of Ashe to be located at the Hall of Fame. Ashe approved DiPasquale’s idea and stipulated a short list of features he wanted the statue to incorporate. Shortly before sculptor and subject were to meet, Ashe died on February 6, 1993. The Sports Hall of Fame proposal went moribund after the death of its inspiration, but the statue lived on. It came to public attention in late 1994 when Virginia Heroes, a mentoring organization founded in 1990, announced a $400,000 fundraising campaign. Richmond City Council pledged $100,000 toward the project. Former Virginia Governor L. Douglas Wilder (the nation’s first elected African-American governor) suggested that the statue should be erected on Monument Avenue. For the next 18 months, Richmonders and interested outsiders engaged in a wide-ranging discussion of the past, present, and future meaning of Monument Avenue. As Paul Woody had written, placing the Ashe statue on Monument Avenue made a powerful statement about a new, more inclusive, Richmond. That symbolic gesture met with expected and unexpected opposition during a debate that confounded the customary racial battle lines. Boone and Mayor Leonidas Young lobbied to build the statue downtown. Others embraced the ironic symbolism of locating it near the public tennis courts that segregation laws had prevented young Ashe from using. As politicians, pundits, and the public weighed in, the city’s architectural and planning boards approved the Monument Avenue location. On the eve of a planned groundbreaking, City Council put on the brakes, acknowledging that there had been no opportunity for public input. Council set a date for a public hearing; public officials and media from around the world prepared for another bitterly divisive showdown over race and the Confederate legacy for which Richmond had become famous. As the arts community lobbied for a new design, Ashe’s widow, Jeanne Moutoussamy-Ashe, threw the whole project into doubt with an op-ed column published on New Year’s Day, 1996. “No, I am not in agreement with the decision to place the ‘Arthur Ashe monument’ on Monument Avenue,” she explained. “My reasons are not politically driven; nor are they artistically or racially motivated. I have always felt that in all the controversy, the spirit that Arthur gave to Richmond has been overlooked. I am afraid that a statue of Arthur Ashe on Monument Avenue honors Richmond, Virginia, more than it does its son, his legacy, and his life’s work.” She urged, instead, that the city return to her husband’s original idea: an African-American Sports Hall of Fame. 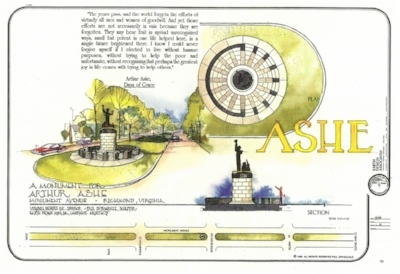 For several months, Richmond entertained the idea of a two-statue approach: locate the DiPasquale statue on Monument Avenue until the city could raise the funds for the Hall of Fame, then relocate the statue there and erect in its place on Monument Avenue a new Ashe statue to be commissioned after a proper design competition. By late March 1996, an impatient City Council nixed this complex proposal and reaffirmed its commitment to DiPasquali’s statue on Monument Avenue. The remaining opposition came from a small group of Confederate heritage activists who tried unsuccessfully to convince the courts that the city must respect for all time Monument Avenue’s original Confederate character. “Everybody knows that this Avenue was constructed as a Confederate memorial through its entire length,” insisted Ed Willis six weeks before the scheduled monument unveiling. Although criticism of DiPasquale’s design persisted (a national magazine, Mental Floss, in 2014 designated it one of “10 Unintentionally Horrifying Statues of Famous People”), the statue soon became a familiar and accepted part of the landscape. Located three long blocks west of the previously westernmost statue (Maury), it was included in the Monument Avenue National Historic Landmark District designated in 1997. Matthew Mace Barbee, Race and Masculinity in Southern Memory: History of Richmond, Virginia’s Monument Avenue, 1948-1996. Lexington Books, 2013. Brian Black and Bryn Varley, “Contesting the Sacred: Preservation and Meaning on Richmond’s Monument Avenue” in Monuments to the Lost Cause: Women, Art, and the Landscapes of Southern Memory, edited by Cynthia Mills and Pamela H. Simpson. Knoxville: University of Tennessee Press, pp. 234-250.